Positive psychology is the scientific study of optimal human performance and well-being. This rich field of research is contributing new insights and proven strategies to help individuals and organisations flourish and thrive. For individuals, positive psychology practices can lead to greater happiness, fulfilment and success in nearly every life domain, from health and longevity to workplace performance, creativity and relationships. Applying positive psychology at work can increase employee satisfaction, engagement, wellbeing and business performance, and make organisations more energising places to be. 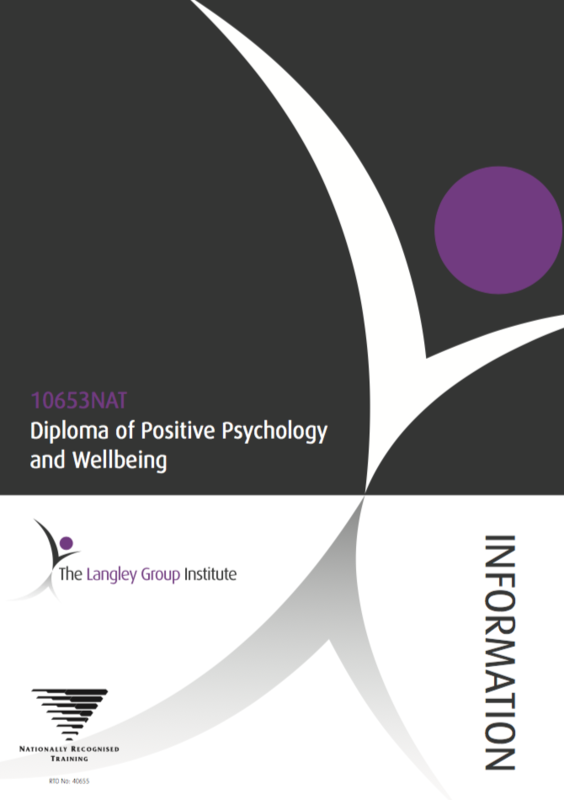 Informed by research and best practice, the Diploma of Positive Psychology and Wellbeing offers an inspiring, practical and robust learning opportunity for all those who want to apply positive psychology in their work and lives,. The Diploma of Positive Psychology and Wellbeing equips you with the knowledge, skill and competence to apply positive psychology principles to increase individual, business and collective wellbeing. You will learn to measure and build individual, workplace and educational flourishing; and successfully plan, implement and assess positive psychology interventions and strategies to make a significant and positive difference. Coaches, consultants, human resource professionals, business leaders, psychologists, teachers, health professionals and others who would like comprehensive, credible training in applied positive psychology below post-graduate level. To be awarded the Diploma, participants complete eight units of competency made up of six core units and two electives. We blend high quality face-to-face training over six days with facilitated small group coaching by teleconference and webinar, personal coaching, workplace practice and assessment for rich experiences and real world learning. The Diploma is an Australian nationally-recognised qualification which is also recognised by the Australian Skills Quality Authority. We are able to run the Diploma in your place of business if you can provide minimum student numbers, anywhere in the world. If you would like to learn more about how the Diploma can assist you and your team, please contact us. Course details, frequently asked questions, enrolment and fee information and more.